Artemis Brass is made up of five professional musicians (two trumpets, a french horn, a trombone and a tuba) who work with many of the UK and Ireland's orchestras, and regularly contribute to BBC TV's Songs of Praise. We are based near Belfast and perform all over Ireland. We play 'occasional' music for special events including wedding processionals and trumpet voluntaries, in addition to a wide range of beautiful classical music suitable for register signing and background music for drinks or corporate receptions. can also be provided. Our repertoire list will provide a starting point for your selection - including a full range of spectacular fanfares. However, should you have any specific requirements not included on the list, please be sure to get in touch. — Sarah Sharp, VSA, Mount Stewart House and Gardens. 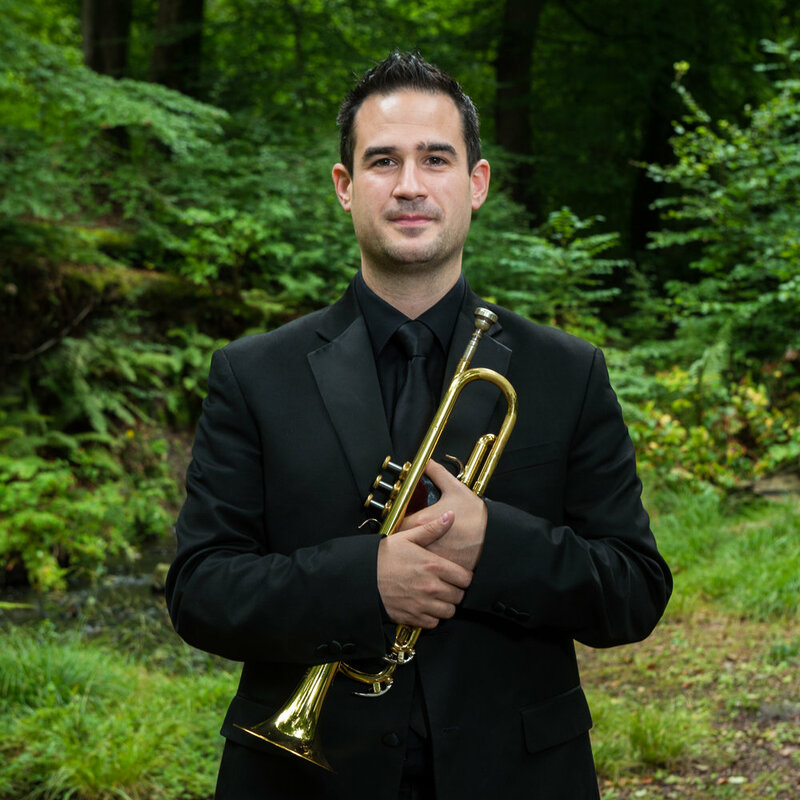 Originally from County Kildare, David studied trumpet at RSAMD in Glasgow, Sibelius Academy, Helsinki and completed an MMus in Trumpet at the RIAM in Dublin graduating with distinction. He was a member of the European Union Youth Orchestra (2009-2011) and has performed at the BBC Proms. David has performs regualrly with RTÉ National Symphony and Concert Orchestras, and the Irish Chamber Orchestra, in addition to holding the position of principal trumpet no.2 with the Ulster Orchestra (2016-2018). He combines responsibilities as a teacher at the Royal Irish Academy of Music and DIT Conservatory of Music with the role of Artistic Director of Dublin Brass Week, Ireland’s international brass festival. Pamela studied at the Guildhall School of Music and Drama in London and was a founding member of Brass Spectrum Brass Quintet. She has performed with the RTÉ National Symphony Orchestra, the RTÉ Concert Orchestra, and the Ulster Orchestra. As a soloist she has performed in the Ulster Hall, Belfast, and across Europe. She works as a trumpet teacher and music arranger, and contributes important education work as a member of Brass Spectrum and Artemis Brass. Since graduating from Trinity College of Music Jacqueline has worked with a variety of stars including Paul McCartney, Phil Collins, Bryn Terfel, and Lesley Garrett. Her orchestral CV lists such UK bands as the Philharmonia (at the BBC Proms), the London Philharmonic Orchestra and the City of Birmingham Symphony Orchestra. She continues to work with the Ulster Orchestra, the Irish Chamber Orchestra, and the RTÉ National Symphony Orchestra and Concert Orchestra in her native Ireland. As a tuba soloist, Les is known for his musicianship, artistry and high level of communication. His three solo releases, Salt of the Earth, Shine and Affinity have won numerous awards including Brass Band World, British Bandsman, and the prestigious Roger Bobo Award in Recording Excellence. Les is also part of the tuba section of the Brass Band of Battle Creek and as a chamber musician is a member of the Fine Arts Brass Ensemble. He has also performed with orchestras throughout the UK, including the Hallé, RTE Concert Orchestra, Ulster Orchestra and London Symphony Orchestra. Les teaches at the RNCM, RNCM Junior School, Salford University and Birmingham Conservatoire. Find Les at tuba-artist.com or on Facebook. As a freelance trombonist Ross has worked in London, Barcelona, and across Ireland. He is currently principal trombone with the Wexford Festival Orchestra and travels extensively to work abroad, including the Cyprus Symphony Orchestra, where he has been guest principal trombone since 2010, the Hong Kong Sinfonietta, L’orchesta Nazionale della RAI, Torino, and the Royal Scottish National Orchestra. Ross has also played with the BBC Scottish Symphony Orchestra and the Orchestra of the Scottish Ballet. Alongside his playing commitments, Ross takes an active role in music education, having taught for several years at the City of Belfast School of Music and also at Methodist College, Belfast.